One of the most interesting panels at Netroots Nation came toward the end. It was a group of some of my favorite national bloggers talking about the political impact we as blogger-activists are having and about how our tactics need to change given that we are no longer the opposition. And, because the national conversation at the moment is about healthcare reform, that was the focus of the discussion. The consensus was that if the Democrats are unable to win on healthcare reform, which means getting a robust public option, we will be unable to win on any other major issue. That means no serious climate change bill for starters. Bills on credit card reform and public transportation are due up in September. We have to learn how to make use of our majorities. We have to wrest control of this nation away from the lobbyists and this is the place to begin that fight. 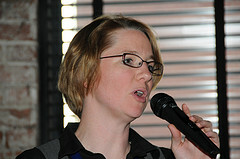 Darcy Burner, now Director of the new organization, American Progressive Caucus Policy Foundation, moderated the panel. Joan McCarter of DailyKos, David Waldman of Congress Matters and DailyKos, Chris Bowers of Open Left and Jane Hamsher of Firedoglake participated. Joan said that we now have allies in Congress who are being very helpful in letting us know scheduling issues. We are trying to figure out how to get the same from the White House. She said that progressives are exploring what can be learned from the FISA fight of two years ago. David elaborated, saying that FISA taught us that it was possible to get the lesser bill even when it should have been possible to get the better one because more legislators actually wanted it. He has been explaining how that happened to progressives. He said understanding the complex procedural possibilties has made it easier for them to believe that it is possible to avoid the same fate this time. Historically, Chris Bowers said, the Blue Dogs have been able to water down legislation. This time progressive bloggers and progressive Congressional members have been working together. Previously the progressive bloggers were brought in to hear the strategy and report on it. This time they've been brought in to participate. Jane Hamsher has been working on a strategy to get 40 progressives to commit to refusing to vote for a plan that doesn't have a public option. Democrats who make that commitment are being supported by a large community who have, as of last Thursday, raised $300,000 for their reelection, as of 8/20, five days after the panel, $400,000 as of today. Darcy said that the working model for making the Progressives more critical to any legislative process included three steps: 1) Find a piece of legislation that is important enough that it must be passed. 2) Find the line that Progressives need to hold. In this case it is the public option. 3) Encourage the members to vote the right way. She added that the key is to find a sufficient number of carrots and sticks to make this work. Darcy said that in the case of healthcare, we would already have lost had we not done it. Everyone on the panel reiterated that the next couple of weeks are critical with the Town Halls coming up. Darcy asked each of the panelists to talk about what we should be doing. Joan said we need to be showing up to the Town Halls and emailing our Senators and Members of Congress. She reminded us not to get upset at the anger and not to get discouraged. Jane said that the Members of Congress have been traumatized. They will not likely be as resilient as they would have been a month ago before the Town Halls got so nasty. Firedoglake has built a database of upcoming TownHalls. Our members of Congress need to see us there supporting the public option and supporting our members who are being staunch supporters. Chris said that it is essential that people push back. If the Progressive Bloc doesn't hold, the bill will only get weaker and weaker and give more and more to corporate interests. Joan added that this will happen to bill after bill if we don't stop it. Darcy said that the Progressives will be tested. She said that the Blue Dogs and Senator Baucus are being backstopped but that the Progressives aren't (well, now thanks to that money being raised for them through the Internet, they are). Chris noted that there are 22,000 lobbyists who are essentially free staff members for those in Congress supporting health insurance interests whereas we have next to no lobbyists. On the other hand, David said that we are doing a very good job getting information out and that the House staffers are getting very good at getting us information about what is going on. Jane summed up what we are working on here - are the lobbyists going to have control of this nation or are the people? 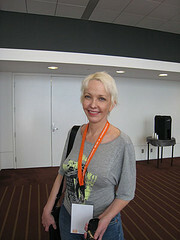 This page contains a single entry by Lynn Allen published on August 24, 2009 5:09 PM. The Truman Project Stumps for Climate Change was the previous entry in this blog. Upcoming Town Halls is the next entry in this blog.